Master the art of casual conversation and you could talk your way into your next job. Small talk your way to a new job. Small talk has a bad reputation for being superficial—so much so that some people avoid it at all costs. But if you can make small talk meaningful and genuine (read: not about the weather) it can be the starting ground for a new relationship, and maybe even a meaningful professional contact. “Don’t be a small talk hater,” says Emily Merrell, founder of the New York City–based networking group Six Degrees Society. “Every day is filled with networking opportunities and you don’t know where they could lead. Small talk is an easy way to fill 25 seconds of silence and might lead to a new best friend, business partner, or workout buddy,” she says. Monster spoke with experts to get their tips for mastering small talk, so you can practice your networking skills whether you’re at the dentist’s office, on a first date, or yes, even at a job interview. It’s not just introverts who cringe when they’re forced to make small talk with strangers. It can be intimidating for anyone to start a conversation out of nothing and keep it going—especially if you have some degree of social anxiety. Dr. Elizabeth Cohen, a New York City–based clinical psychologist, says if you’re someone who truly loathes making conversation with strangers, try understanding why you don’t like small talk. Are you afraid of what the other person might think of you? Are you worried it will be awkward? Are you uninterested in speaking to someone that you might never see again? “Once you highlight the reason you dislike small talk you can make an action plan to conquer your fear or avoidance,” she explains. If you worry you’ll embarrass yourself by saying something awkward, remember that it won’t seem like a big deal for long. What’s the worst thing that can happen? You don’t talk again or they whisper about your encounter? You’ll get over it. And if you think talking to strangers is totally pointless, Cohen suggests asking your friends about small talk experiences they’ve had that sparked a valuable relationship, so you’ll have something to inspire you as you begin your small talk training. Finding the courage to make the first move is hard, but someone’s got to do it. Plus, the person you’re speaking with probably doesn’t want to deal with the awkward silence either. So you can break the ice. “Create a 30-second introduction that you can use anywhere,” says Jennifer Braganza, founder of the North Carolina career coaching company Exponential Success. “It doesn't have to be all about work. In fact, I recommend including your hobbies and passions. For example, I often mention that I am proud of my two furkids which automatically kicks off a lively conversation about pets,” she says. This doesn’t mean that you walk up to someone and immediately introduce yourself with this “personal pitch.” Start by showing interest in them: why they’re there, what they think of whatever common experience you’re sharing, and once the focus shifts to you, you’ll have a personal pitch at the ready. If you’re small-talking with someone who may have professional potential, you can weave in your elevator pitch too, but try to start personal, because that’s where the fertile common ground may be to create a foundation for something more. Whether you’re in a larger group or a one-on-one conversation , shift the focus to the person you don’t know, and ask questions, so the conversation doesn’t come to a screeching halt. “People love to talk about themselves and are flattered when you take an interest in them, says Brisky. Along with asking questions, listen to people's responses. “Don't just jump into your own story that is sort of similar to what they are saying. Ask follow up questions,” she says. Volleying off what people share will help you get into a conversational flow like the one you’d have with a friend and it leads to a more memorable conversation. “After the event, it will make a more lasting impression on the person that you didn't just ask one question and move on—they'll remember that you engaged them on a deeper level,” she explains. If you want to follow up or you see the person again, you’re well on your way to creating a “real” relationship and not one that feels surface-level. To fine-tune your small talk skills, it might help to start with a friend. 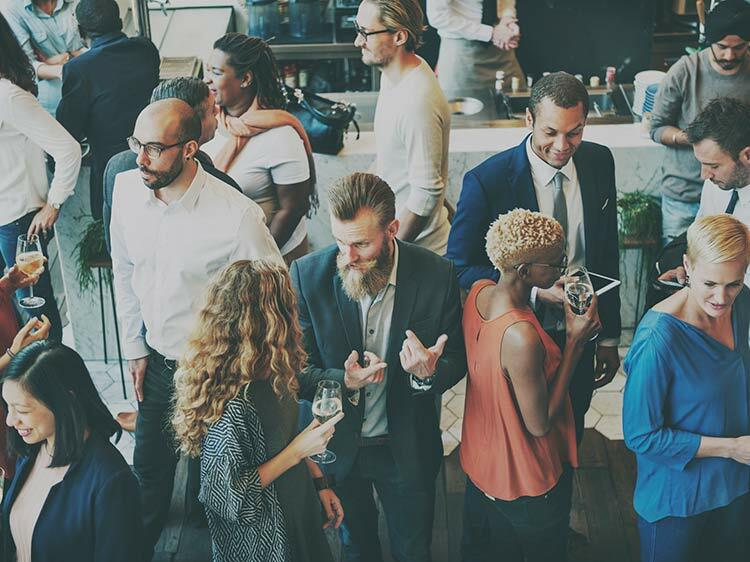 If you have to go to a networking event or even an acquaintance’s party with people you don’t know well, bring reinforcements. “Bring someone who is a bit more extroverted than you, as they may be more comfortable with starting up conversations and finding a way to pull you into them,” says Carolyn Birsky, founder of the Massachusettes-based career coaching firm Compass Maven. An easy trick for you to start small talk is to introduce them to your friend. For instance, if you’re seated next to someone else or waiting in line to get a drink with your friend, introduce the stranger to your friend and fill them in on what you were speaking about when they join the conversation. Remember the old saying, ‘practice makes perfect’? Well, it’s true about mastering the art of small talk. And what better way to put your new skills to action than to line up some job interviews. When you join Monster you can upload up to five versions of your resume, so recruiters can find you as soon as the jobs become available. We’ll also send you weekly job alerts by email, as well as expert tips on networking, negotiating, and career advancement.